The Bureau of Land Management administers more than 247.3 million acres of public lands (1/8th of the landmass of this country). 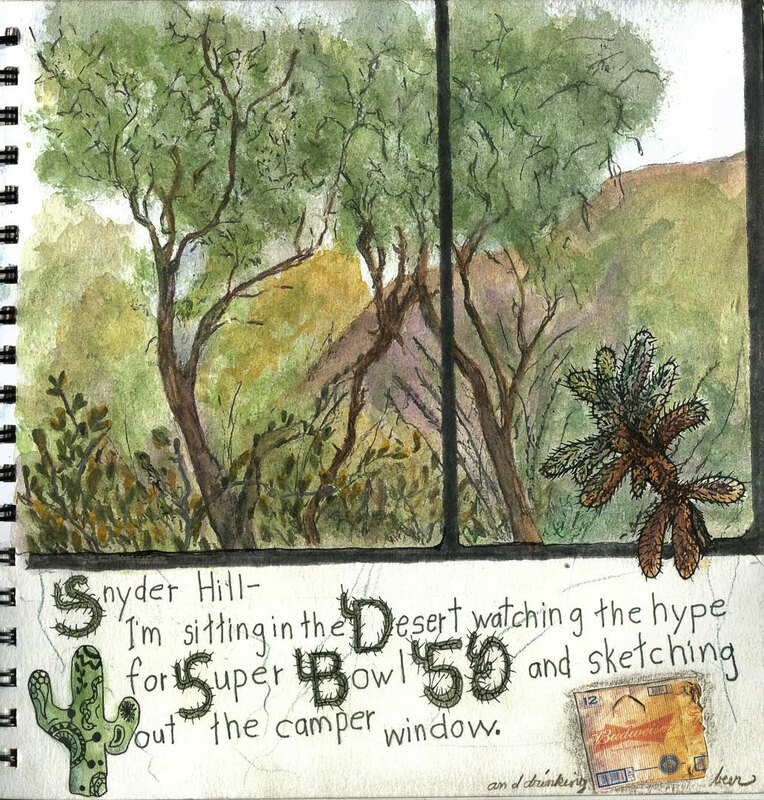 For the past month we have been living free on our own little patch of BLM land beneath Snyder Hill outside Tucson Arizona. Not exactly culture shock, but it is quite a change from living on our cousin’s beautiful estate outside Phoenix. Some nights, walking in the desert, I listen to the gentle barks of the coyotes chatting nearby and the lovelorn hoots of the great horned owl calling from the cliffs above. Walking in the Desert at Night: Gouache. 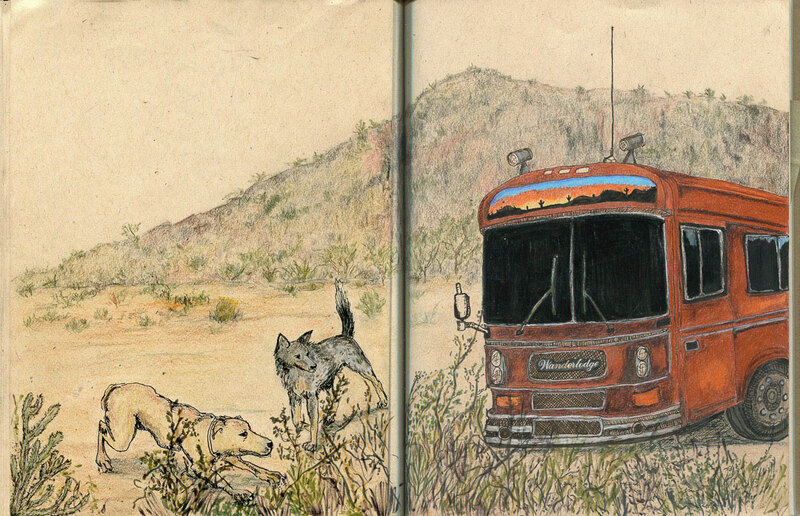 Other nights when I’m out with Sully I scurry quickly back to the camper to avoid the several men washing from a big bucket and sleeping beside an old black sedan parked in the scrub.The men come in after dark and are gone before I walk the dogs in the morning. This particular piece of BLM land is never empty. All kinds of people and rigs come through - some stay for a while and others appear to have been here forever. From the Italian couple who spoke almost no English and had come to America 40 years ago and been on the road ever since - to the handsome family in the $200,000 triple-axel, traveling mansion, this patch of land has a place for everyone. The smallest set up was Mike and his Harley with a sidecar that opened into a tent. He had been laid off by Verizon in Boston and decided to get on his motorcycle to journey around the USA for a while. Find himself? Two of the neatest and most likable people we have met on the road we met here. Ching and Jerud set out almost a year ago to LiveSmall/Ride Free. They rebuilt an old fifth wheel and created “The Toaster” a stylish and unforgettable vehicle. where they live with their two dogs in a fossil fuel free, all-electric RV towed by a truck running off waste vegetable oil. Can’t wait for the next wheeled residence to pull in here. Will the inhabitants offer me a blessed day and a joint or want to interview me for their blog? I’m ready for anything! Just wanted to let you know that there are still folks out here hanging on your every word and photograph ... keep those updates coming and keep living the dream. Maybe one day Crystal and I will be in places with platypie. You guys seem to run into the most amazing people. Amazing adventure, Peg. It is almost as if a 'timequake' slapped you back to the 1960s! So cool! I'm so glad you took pictures of the hippies before they left. It'a great portrait of our actual home. Did I miss the Italian couple? I speak Italian (lived there for a year). Would love to meet them! The homeless concerto, the beautiful desert sunset and the hippies make for a John Denver "you fill up my senses" kinda road trip. I really enjoyed this one...thanks. These pictures are so beautiful. Makes me wish I was there:) Just woww? ?